If you die without having made a will then you miss out on having your final say as to what happens to your possessions after you die. 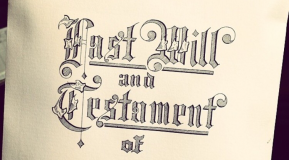 The official term for dying without having made a will is to die ‘intestate’ and the ‘Rules of Intestacy’, set out by the Government, are followed to dictate as to how your estate is administered after your death. The rules vary depending on whether your estate (the total value of all your possessions including your home and all personal possessions) is valued at more or less that £250,000 and there may be variations depending on whereabouts in the UK you live. If you are married or in a Civil Partnership when you die and your estate is worth more than £250,000 then the rules are a bit more complicated. Take a look at the Government’s website to see what would happen in your situation. marry or form a civil partnership under this age. Until then, trustees manage the inheritance on their behalf. With around 40% of the UK thought not to have made a will the Rules of Intestacy will in these cases be adhered to. It is also important to review your will regularly and keep it up to date. If you like to see an Adviser to see about making a will simply complete the form below and we will get back to you shortly.